There are very few things that I regret from our wedding. The major one is that I didn't surgically attach my bouquet to my wrist. 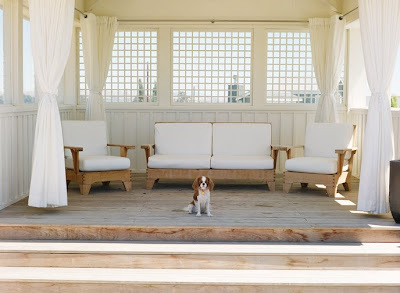 Another is that we don't have any photos of our beloved Cavalier King Charles Spaniel, Maisy. 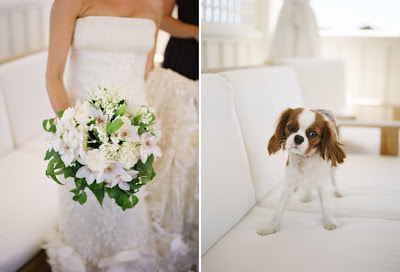 The Catholic church isn't big on dogs walking brides down the aisle, but she was present that day. She was allowed to stay at our hotel, which means that I got to see her that morning and she was living it up with the rest of us at the after party. I do not, however, have any photos of her. While looking through these photos of Juliet and Gregor's gorgeous wedding on snippet & ink, all I could think was "damn!" I mean, dogs at weddings? Genius! How freaking cute is little Gwenyth? All photography by Meg Smith. 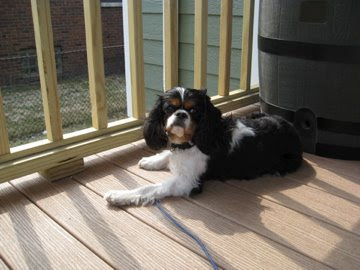 And here Maisy, lounging on our deck, wondering why she couldn't have been a dog model. 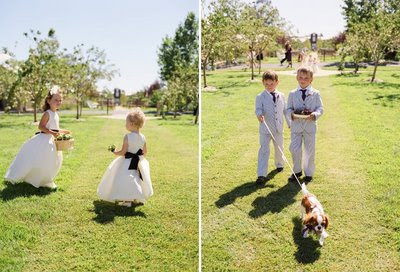 i had huge dreams of an outdoor, rustic wedding with my family golden retriever and todd's and my golden retriever walking with me down the aisle. bummer. no rustic wedding and no dogs. i really missed having them there! these pictures are adorable! My cavalier Pesto joined us at our reception. It was indoors at an estate and they still let him party with us! Your cavi is soooo adorable! I think dogs at a wedding is genuis as well. We are having our wedding & reception at an art gallery. We really wanted our two 6lb dogs to be apart of it since they are a MAJOR part of our life. The venue agreed for them to be in the ceremony. (our ring bearer will be pulling them down the asile in a decorated wagon) However i still cant get out of my head, will people think we are crazy for having our dogs at an indoor ceremony? I'm still planning the table settings for my wedding and I saw the adorable table numbers and table number stands/holders you had. Where did you get the stands/holders??? I am looking for something EXACTLY like them! Jamila- I got them from hobby lobby. How many did you need? How sweet. Truly man's best friend. I have not even asked yet if our dog can be present at our ceremony because I am terrified of the answer. We are already getting grief anyways because we didn't invite children so we are afraid out dog might be a slap in the face..... but I WILL regret not having Helmsley there when it is all said and done. Keep your fingers crossed!!! I have a bride this summer getting married at an outdoor venue on the lake, and she will get to have her dog as a ring bearer. Whether or not he makes it down the aisle, it will be super cute and it means a lot to her! those pictures are adorable, what a great idea!